Advantage Multi for Cats is a once-a-month topical treatment that used a powerful, but safe to use, insecticide (imidacloprid), in conjunction with a parasiticide (moxidectin), to help prevent the a wide variety of irritating critters from inhabiting your cat. Effective against fleas, mites, a number of worms (hook, round, and whip), and heartworm prevention for cats, Advantage Multi for Cats is safe to use on cats as young as nine weeks and weighing as little as two pounds. One application of this medicine is enough to guarantee up to 30 days of complete protection, so keep your cat safe with Advantage Multi for Cats. In some rare cases, cats that are sensitive to the ingredients in Advantage Multi for Cats may experience sluggishness, changes in behavior, general discomfort, excessive salivation, increase in thirst, coughing, and/or gagging. If these symptoms persist, consult your veterinarian immediately. Oily buildup or stiffness may occur around the area of application. 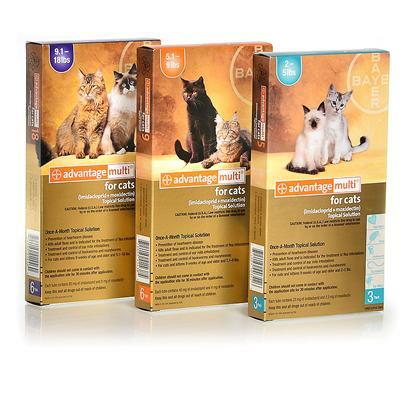 Advantage Multi for Cats is not to be used on sickly or underweight cats, and is only ment to be used topically. If ingested orally, it can cause hypersalivation, tremors, vomiting, and appetite loss. Consult a veterinarian to determine the proper dosage of Advantage Multi for Cats for your pet. Break the seal and remove the cap of a tube of the appropriate dosage; part the hair at the base of the cat’s head, place the tip of the tube on the exposed skin and apply the entire contents of the tube. Lift the tube away from the skin and then release the pressure. Keep the product away from the cat’s eyes; do not allow the cat to lick the product or ingest it in any way, and keep pets separated from each other to prevent them from licking each other’s application sites.